Living: In spite of their size, these dogs do quite well in an apartment if they are sufficiently exercised. 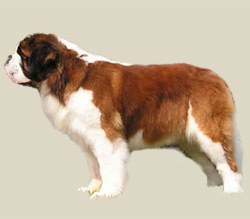 The Saint Bernard is a very large, strong, muscular dog, with a powerful head. As long as the weight stays in proportion with the height, the taller the dog the more prized. There are two types of coat: rough, and smooth, but both are very dense and come in white with markings in tan, red, mahogany, brindle, and black - in various combinations. The face and ears are usually shaded with black and the expression is intelligent and gentle. In the rough-coated dogs, the hair is slightly longer and there is feathering on the thighs and legs. The feet are large with strong well-arched toes, making the Saint Bernard"s sure-footed in the snow and ice. They have a highly developed sense of smell and also seem to have a sixth sense about impending danger from storms and avalanches.